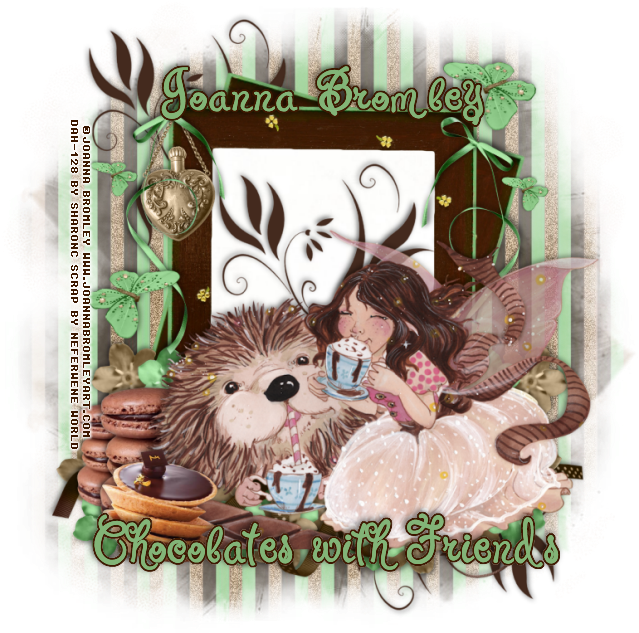 I am using the awesome artwork of Joanna Bromley. Resize paper 3 to 22% paste, RR Mask 2-1, delete and merge group. Resize paper 5 to 22%, paste MPM Mask 54, delete and merge group. Resize element 22 to 35%, paste, free rotate to the left at 90. Click inside with magic wand expand by 5, resize paper 3 to 20%, paste invert delete. Duplicate the frame, on the bottom one rotate to the right at 15.
place at the upper left, duplicate, flip and mirror to the bottom right side. Resize your tube to 70%, place at the bottom part of the frames. Resize element 36 to 50%, place on the upper left of the frame. Resize element 2 to 15%, place on the left below the tube layer, duplicate, resize to 70%, move below the first one and out to the left some. Resize element 11 to 15%, place on the left above the tube layer. Resize element 27 to 25%, place on the heart locket, duplicate, mirror, move down just a bit. your tube layer at the bottom in different areas. Resize element 26 to 80%, place at the bottom under your tube layer. where you like, duplicate one again, resize to 50%, place at the upper right side again.